Equipped with relay output alarm. 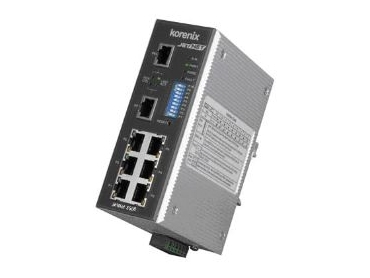 KORENIX Technology, represented by Global Automation , has introduced the JetNet 3500 series Industrial Unmanaged Redundant Ethernet Rail Switch. The JetNet 3500 series is a 5-/8-port unmanaged Ethernet switch with plug-n-play Super Ring function and relay output alarm for port break and power failure. Specifically designed for industrial applications in harsh environments, the JetNet 3500 series is also equipped with dual power inputs, which complete the series with both network and power redundancy. The JetNet 3500 series comprises of 2 models: JetNet 3505 Industrial 5-port Unmanaged Redundant Ethernet Rail Switch and the JetNet 3508 Industrial 8-port Unmanaged Redundant Ethernet Rail Switch. Industrial applications often require data communications to be intact all the time. Data loss of any kind might cause damage in terms of time and money. The JetNet 3500 series’ Super Ring technology equips a company’s system with network redundancy. Normally, the backup path in this ring topology network is blocked. But once any segment of the primary path is broken or disconnected, Super Ring technology allows the backup path to be activated, making sure that data transmission over the entire network will not be interrupted. A fast recovery time of less than 300ms ensures the system can run non-stop. Relay output alarm for port break and power failure helps with monitoring each port's status. Without relay output alarm, system errors may not be discovered until too late. Since JetNet 3500 is equipped with relay output alarm, once port break or power failure occurs, administrators can be notified of emergency situations and react promptly to system errors, preventing great loss caused by not being able to locate problems as soon as they occur. The dual power inputs provide you with power redundancy, giving you extra assurance for the integrity of the entire system and network. To cope with harsh industrial environments, the JetNet 3500 series comes with a one piece-formed aluminum case, which complies with IP30 standard. The terminal block and ventilation holes on the bottom side of each unit reduce the chance of damage due to dust and moisture ingress.